I was envious that so many of my former classmates made it to the SMKPP Centennial Gala Dinner held on 20 September 2014 in Kuala Lumpur. Three flew in from Australia, Hong Kong and Singapore. Heck, even my husband flew home and arrived that very Friday night, he could have made it to the dinner the following day on my behalf (but that’s another story)! So I was left “Alone in Accra” (ok, I was left with the girls), getting updates and photos from my sisters and friends, as eagerly as football fans awaited the World Cup. From this far end, I also managed to reconnect with some former schoolmates back in Malaysia. What a reunion it was for them! Prior to Saturday’s gala dinner, they caught up over lunch. After Saturday’s dinner, they stayed up till wee hours of the morning, and were up early Sunday for breakfast, lunch, dinner/supper, truly a makan marathon. Stories and photos of their Sunday’s fun and food-filled outings, filled up my Sunday in Accra. Who knew I was about to be rewarded with a reunion of my own! On Sunday night, (rather Monday morning past midnight), as I was hitting the sack, a WA message came in from my sister. Out of the blue, her friend SylviaC had asked if I still remember her cousin OKP. My eyes flew wide open and my fingers went to work. “OF COURSE I remember OKP”, I replied to my sister and begged her to get me OKP’s contact. So the secret is out, I didn’t find OKP, it is thanks to my sister and her former classmate SylviaC who turns out to be OKP’s cousin. Who knew! OKP and I were in Standard One in PEPS (1) when SylviaC and my sister were in Standard Six. SylviaC went on to become the head girl of PESS in 1981 (my sister was the assistant head girl) and had left quite a lasting impression on me. If I had known they were cousins I would have found OKP much earlier! Truth be told, I have wondered all these years where OKP was. OKP left the school when we were in Standard Three (1978), we obviously kept in touch after that because I still have the CNY card she sent me in 1981 as well as a black and white passport-sized photo she gave me as a keepsake, and a few photos we took together which are kept at home. Over the years, I did try to look up OKP. I was successful before in locating my lost Scottish pen-pal when I was in the UK, as well as a varsity roommate when I was in HK; and recently got re-connected with a Ghanaian varsity course mate after losing touch for 17 years, through a bit of “detective work”. However, I wasn’t successful with OKP. And today, 33 years later, I am glad to say I found my friend, OKP 🙂 This sweet virtual reunion is indeed the icing of the cake! 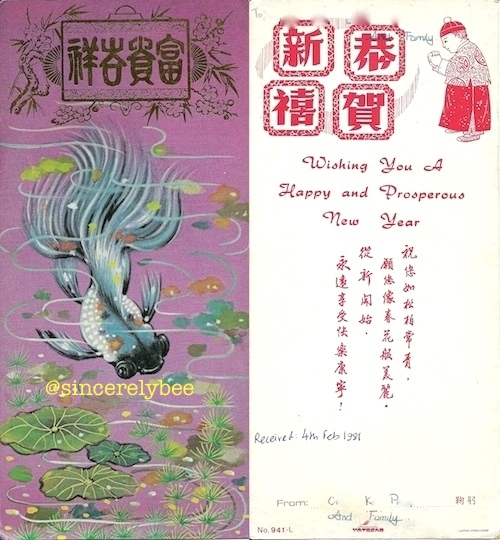 This CNY card I received from OKP on 4 Feb 1981, is also the last piece of news I had from her. I officially re-connected with OKP on 22 Sept 2014. Three days later on 25 Sept , we “saw” each other again for the first time in 36 years! The photo exchange episode was a hilarious one! Within the next three days too, OKP became a “wanted” person. She WA on 25 Sept that a colleague from another department (who also happens to be my sister’s former classmate) alerted her that a classmate’s sister was looking for her long-lost classmate. And that very day, OKP also received an email from “complaints department” (!!!) that another person (WK, another Std. 1 classmate) was looking for her too! On 27 Sept, all three Standard One friends were finally “reunited” albeit virtually, after three decades. Yeah!!! This entry was posted in Forever Friends, School Days and tagged Accra, Africa, Friends, Ghana, PESS, School. Bookmark the permalink.